The Fade Out Message action displays a message on the screen for a short period of time. The message fades away after a specified duration. Specify how long the message should be displayed before it disappears. Enter duration in milliseconds. E.g. 2000 is 2 seconds. Specify whether the message should be placed in a div or in a placeholder control. Specify the ID of a DIV on the page where the fade out messages should be shown. Specify the ID of the placholder control where the fade out message should be shown. If you select 'Default', the message style is based on the current component style (e.g. 'GrOlive', etc.) and the message is styled using CSS classes in the current style. If you select 'None' you can style the message yourself. 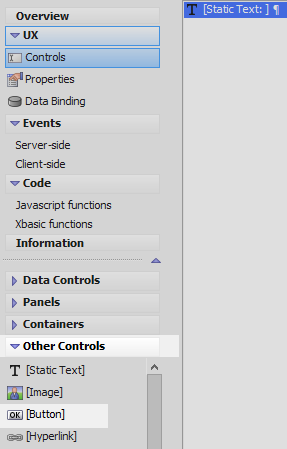 In the UX Builder on the 'UX Controls' page, open the 'Other Controls' menu. Click on the [Static Text] option to add a static text control to the component. 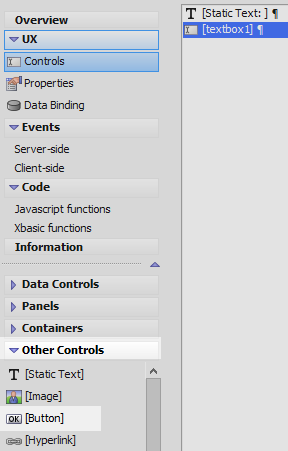 In the 'Other Controls' menu click on the [Button] option to add a button to the component. Type 'fade' into the Filter list control, highlight the 'Fade Out Message' action in the actions list, and click OK. In the action definition set the 'Place message where' property to 'DIV'. Set the 'Div id' property to 'mydiv'. This is the div you defined as the id for the Static Text control. 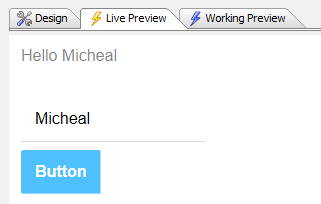 Click OK and Save and run in Live Preview. When you click on the button you should see a message appear and fade out. In the UX Builder on the UX Controls page open the 'Other Controls' menu and click on the [Static Text] option to add a static text control to the component. 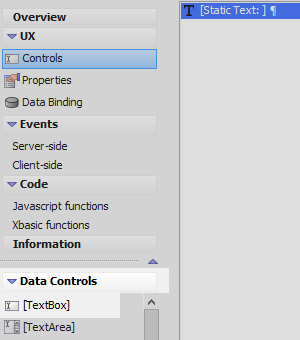 Open the 'Data Controls' menu and click on the [TextBox] option to add a textbox control to the component. Leave the name as textbox1. Open the 'Other Controls' menu again and click on the [Button] option to add a button control to the bottom of the controls tree. Type 'fade' into the Filter list, highlight the 'Fade Out Message' action, and click OK. In the Fade Out Message action's properties list click the [...] button next to the 'Message text' property. Set the 'Place message where' property to be 'DIV'. Set the 'Div id' property to be 'mydiv'. Click OK and Save.